After releasing some pictures of the interior last week, Volvo has now unveiled some additional details about the infotainment system of its 2015 XC90. The car is expected to arrive later this year in the market and is a clear example of design novelty by Volvo. It features a large tablet-like touch screen, a head-up VERTICALLY oriented display and thumb controls on the steering wheel. The panel can even be controlled while wearing gloves because of its infrared technology. A ccording to Volvo it maximizes the integration of internet-based services and other infotainment functions while minimizing driver distraction and the time spent with hands off the steering wheel and eyes off the road. 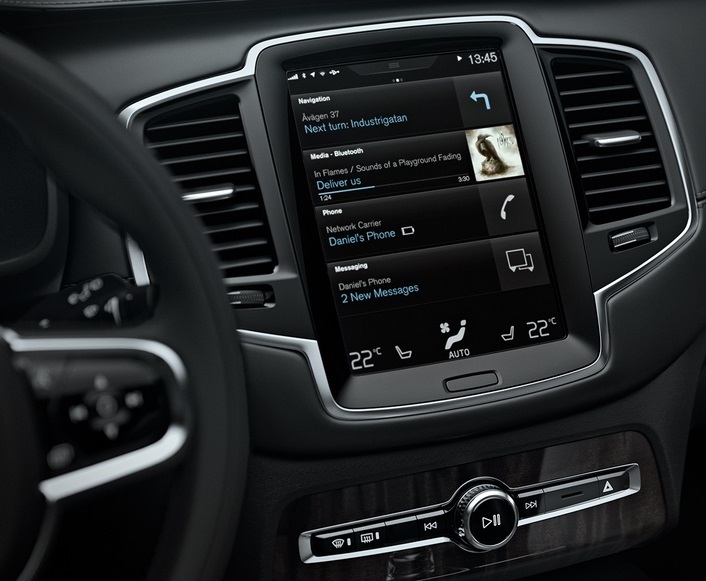 The XC90 will become the first Volvo to offer Apple CarPlay, allowing the screen to mirror the display and functionality of connected iPhone, iPad and iPod devices. It will also feature world-first Park and Pay application, which can locate parking spaces and pay automatically in car parks equipped with the required technology. It will also incorporate satellite navigation by HERE, internet radio, and a service booking application that informs the driver when a service is due and recommends appointment times at their local Volvo dealership. Volvo will announce details of the new XC90’s powertrains in the coming weeks and the exterior design in August. The layout on the portrait screen can be described as a stack of flexible ‘tiles’, each displaying a key functionality. Navigation is on top, followed by media and telephone. A thin notification band is located above the tiles, while the digital climate controls form the ‘foundation’ of the pile. When one of the tiles on the touch screen expands on interaction, the others are compressed but still visible and instantly accessible. This makes the touch screen exceptionally user-friendly, with no need to go via a main menu when switching between functions.